Being a hard worker is a good thing, but smart work makes things easier. Here are things one can do to improve their trading experience. These are the words of Warren Buffet, one of the world’s most successful investor. Trading is a sport; you need years of dedication, practice, and penance to be a good sportsman. Most individuals around us are into trading equities today; we come across a difference in every trader's strategy, thinking, and the way he takes actions. Establishing our stronghold on the vast trading ground requires our proposition to be unique. Being a hard worker is a good thing, but smart work makes things easier. 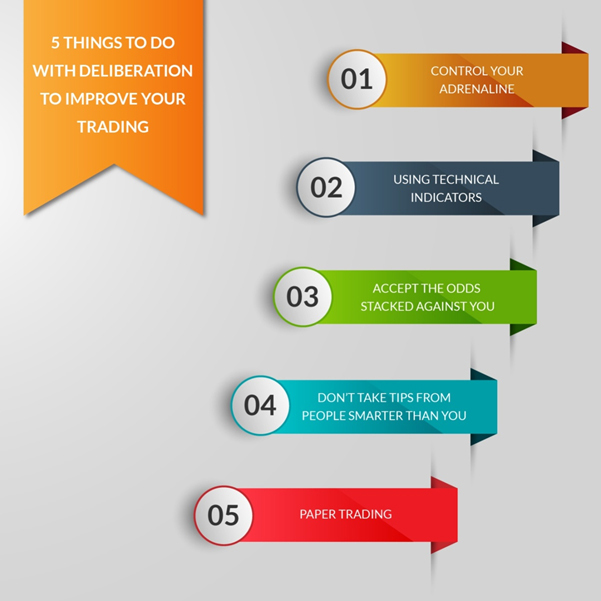 Here are steps one can follow to improve their trading. Control your adrenaline: Controlling emotions is the most critical part of growing your trading skillset. If you experience an adrenaline rush while trading, something is wrong. Being emotionless in trading is the same as being an emotionless gamer. It makes you follow the rules and helps you understand winning scenarios against losing scenarios. Having a gambler's approach to trading is fatal as is believing in two words – hope and luck. Use technical indicators: Learning about technical indicators makes it easy for you to understand the share market. Technical indicators such as those on balance value, accumulation line, averages, and so forth, are essential tools to study. Online trading sites such as 5Paisa.com help you understand the graphs and learning them helps you spot market trends. Technical analysis at your fingertips increases your probability of having a successful trade. Accept that the odds are stacked against you: Always trade keeping in mind that there are smarter people out there. Be true to your plan and act accordingly. Play safe. Taking risk is part of trading, but the risk should always be controlled as there are more prominent sharks around you. Also, keep an eye on your portfolio as a better portfolio means a greater probability of a greater trade. Stop taking tips from people smarter than you: Taking tips from people around you is not always a wise idea. Don’t trust someone even if he/she is your best friend. Every person has a different perspective on the market and there is no such thing as a know-it-all person. One must commit mistakes, learn from them, and create a future strategy. There are many tips available to you, primarily through trading gurus on the television or the internet. Scrutinise them before believing them. Always be diligent when you order equities. Paper trading: Practicing how trade online is an important task before trading with real money. Pilots, too, spend time practicing in a simulator before they fly a real plane. Similarly, an aspiring trader should also use simulated trading portals to practice buying and selling stock without involving actual money. A stock market simulator virtually recreates the stock market for investors of all levels to perfect their trading skills.